YUMMY! This recipe is so full over flavor and I loved it! I found this recipe in a magazine back in 2014 and pulled it out because it looked good and I eventually wanted to try it. I do that often…I go through magazines and rip out recipes that look good and stick them in a folder. Each week I go through that folder and pull out ones I want to see if they are truly worth repeating and this one was on top. So glad I found it! This is a crock-pot meal. School is getting ready to start this coming week, so this recipe will come in handy on school days! I love crock-pot meals on busy days! This one is Gluten Free. If you Gluten Free, grab a a bag of Gluten Free hamburger buns and put the shredded chicken on to make a sandwich. So good! My family ate them on a Kaiser roll and I had these with my Gluten Free hamburger bun. This recipe is full of protein and we paired these with sweet potato coins as a side! Scatter onions on bottom of the crock-pot. Arrange chicken evenly on top of onion. In a bowl, combine ketchup, vinegar, mustard, molasses, onion powder, cumin, garlic powder, Tabasco and salt. Pour over chicken. Cover and cook on low until chicken is fork-tender and sauce has thickened, about 5 to 6 hours. Remove chicken from the crock-pot and shred the meat with 2 forks. Place the shredded chicken back into the crock-pot and coat evenly with the sauce. Serve on your favorite hamburger bun/roll. 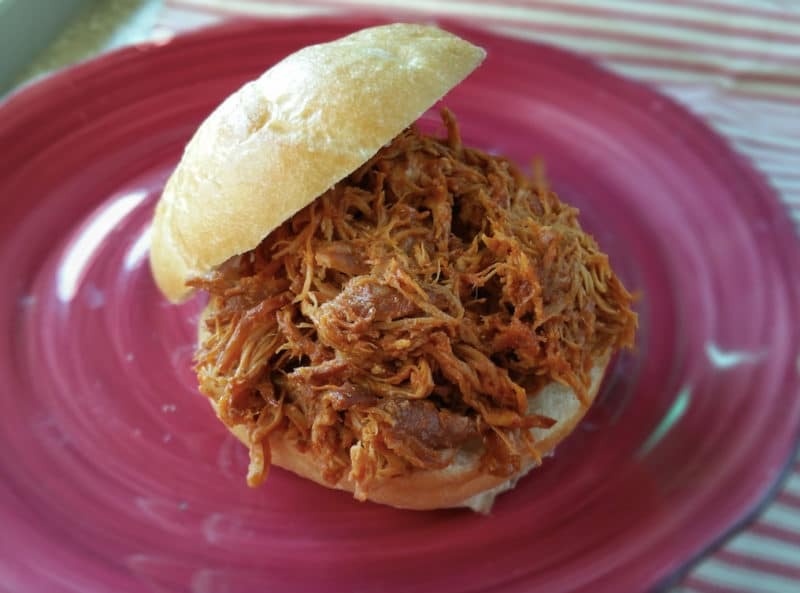 I usually eat pulled pork sandwiches on my Kaiser rolls and so I have never tried pulled chicken before. However, I am sure that I would love to try out your recipe, especially because it includes molasses in it. However, is the purpose of the Tabasco sauce to make the meat spicy? If so, I will probably need to add a little more for my personal taste. Tabasco doesn’t make it spicy…it just gives it a tad bit of a “kick”…so you probably will need to add more Tabasco if you want some spice! Enjoy…my kids LOVE this recipe!